All efforts to reach demanding levels of performance criteria notwithstanding, it must not be forgotten that success in sales or the service industry lies in providing a service for other people. This test is very suited to examine this issue, not least because of its extensive calibration sample. Main areas of application: aptitude diagnostics in the area of personality, industrial and organizational psychology, school, study, and career decisions. 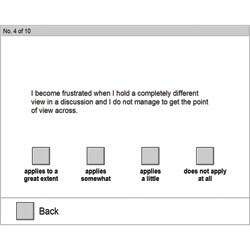 The aim of the development of this test was the creation of a diagnostic tool for the assessment of people's aptitude and inclination for work in the area of client orientation by recording their attitudes and fields of interest in that area. Well-proven concepts were built, based on self-evaluations of the respondents. According to Stratemann (1991) and Kumpf (1990) the situation of the person working in service and sales can be modeled as an activity, or according to Zimolong & Sonnenberg (1986) as communication. From an aptitude-diagnostic viewpoint constructs arose that were defined according to classic test theory and checked according to certain quality criteria. The scales assess motivational as well as competence-oriented concepts as relatively stable personality traits observed over a period of time. The test consists of 94 items, which can be linked to 8 scales. The scales extraversion, empathy, self-monitoring, and frustration tolerance measure capacities, which have to be considered prerequisites for client-oriented behavior. The remaining four scales measure primarily the motivational factors: striving for social acceptance, performance motivation, motivation for providing assistance, and dominance. After the instruction the questions are presented one after the other on the monitor. The respondent answers on a four-level continuum from "Applies to a great extent" to "Does not apply at all". One correction per item is allowed. Omission of items is not allowed. The raw scores for each scale and the response time for each item are recorded. The print comprises a result table with raw and standard scores for all scales and the working time as well as an optional test profile and an item analysis protocol of respondent entries. The reliabilities (inner consistency) of the scales range from .77 to .90. The various examinations carried out to check the validity of the SBUSB have all yielded good results. Norms are based on a sample of 1592 persons. Aside of this norm a representative norm sample is available for N=198 persons aged 18 to 65 years. Moreover norms for the following vocational groups are available: Occupational group – psychosocial and medical professions (N=414) Occupational group – administration and clerical work (N=419). Additionally, age-specific norms of respondents under 29 and over 30 are available here. Occupational group – police (N=572) Occupational group – freelancers and artists (N=187).